Whether you are evaluating a potential investment, estimating taxes or insurance, or looking to list your property for sale, you will need to estimate value using reliable methods and calculations in order to make smart business decisions. Below are key CRE valuation approaches for Boston Commercial Properties. CRE property value is one of the most complex calculations. Determining what a property is worth should take into consideration both current benefits and future use. It is a combination of buyer demand, property utility, available market inventory/alternatives, and transferability. The figure can be a moving target given that interest rates, market conditions, trade laws, environmental conditions, social trends, and political change can all affect value. Both short-term and long-term benefits should be considered in CRE valuation approaches. The current political and socio-economic climate presents some added challenges to CRE valuation. Although our local economy is currently strong, trade wars with Europe and China threaten to increase cost of materials used by many businesses in the US and/or reduce demand for US based products elsewhere. It’s important to look beyond simply the change in cost for building and construction materials. The stress on local businesses could alter the demand for office, industrial and commercial space rentals,… thus influencing CRE valuations. Since CRE valuation includes a variety of factors, it is distinct from the actual cost or price of a property. Cost reflects actual expenses for materials, labor, and financing, which naturally may contribute to value but will not equal value. Likewise, the price for which a CRE property may sell does not necessarily reflect its value either. Ideally, value should play a big role in pricing but there are certainly many instances where the two vary greatly. 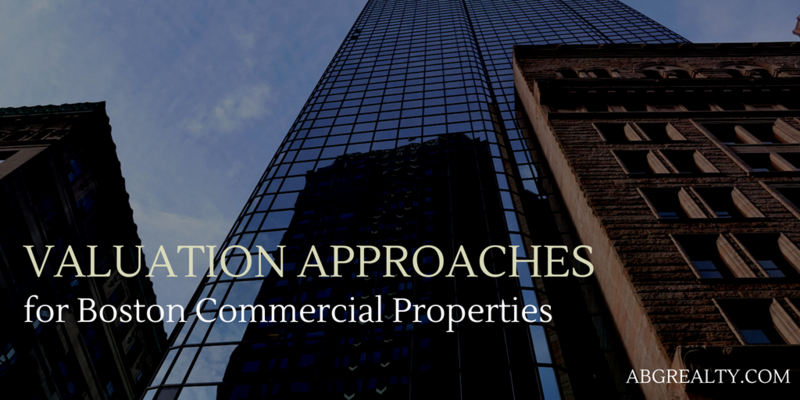 Using the correct CRE valuation approaches for Boston commercial properties requires both an intimate understanding of the local Boston real estate market and bigger national issues. Working with an experienced commercial real estate brokerage is essential to helping you make sound business investment decisions. Contact ABG Realty for assistance from our local commercial experts. We specialize in the sale and lease of office, retail, industrial and other commercial properties in Greater Boston and the surrounding area.